Each one of us looks at the surrounding world in their own unique and unparalleled way. Therefore, the same everyday items, objects, and faces, perceived via one’s own personal inner world, can be interpreted in entirely different ways – as if through a film of individuality and time. Precisely this quality – the imposition of the individual “self” on the surrounding world – is most characteristic of subtle and spiritual personalities; creative figures, among whom there are many great photographers. 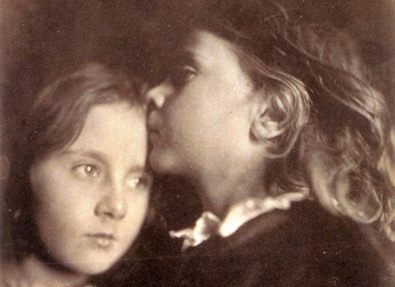 Julia Margaret Cameron is a notable example. M.C. Cameron is fine representative of Victorian era photography. Cameron’s imagination, vitality, and considerable creative advances made it possible for her to convey human character, strength, and spirituality better than any other portrait photographer. In her work she paid particular attention to focusing on the faces of great figures, in order to fully convey the depth of their ideas and wisdom. Cameron created portraits of the most outstanding representatives of her era, and in the process achieved mastery of her own vocation. We only have her to thank for the faces of Darwin, Thomas Carlyle, George Frederic Watts, Alfred Tennyson, Browning, Longfellow, John Herschel, and Anthony Trollope. Cameron’s portraits are like “icons” for the generations that came after her. Common folk didn’t really interest this portrait photographer and pictures she took of average citizens were ordinary and similar to those found on registration cards. They just didn’t inspire Cameron; didn’t evoke in her the creative desire to capture what she was seeing before it disappeared. But, that is just how she was as a creative person in love with her own vocation. Cameron sought intellectual heroes for her photo-portraits and found them in the great figures of the Victoria era. Her studio was more like a gallery of sacred images than a usual working space – Cameron invariably sought out the soul of whoever she photographed. In her hands the camera became an obedient instrument for seeking out the most characteristic facial expressions of her photographic heroes. Cameron never took landscape pictures. In comparison with the greatness of the most talented figures of her time, scenes of forests, fields, and other neighbouring sights failed to stir within her the necessary creative spark to produce genuine masterpieces. Cameron was a confident portrait photographer. However, the manner in which she executed her camera work was relatively primitive (she used lenses which failed to provide clear-cut details of facial contours and that couldn’t focus precisely on her targets), but on the other hand she stood out for her rich creative talent and the presence of something supernatural in, what would appear to be, usual photographic works. Later, this photographic style became widely popular and remained in fashion for a long time within the photography world. Cameron’s approach is best illustrated by her photographs that are “out-of-focus”, soft, and lack sharpness as if “blurred”. This photo-artist captured not the detail, but rather the soul – the true spirit of those sitting before her, using only photographic techniques. This is what makes her works so special. Tennyson and his literary works inspired Cameron to create illustrative allegorical photographs. In the second half of the 19th Century – in 1875 – the first volume containing 12 of Cameron’s works was brought out: they illustrated one of Alfred Tennyson’s works entitled “Idylls of the King and Other Poems”. Several were later printed in the second volume of the book, in which there were an additional 12 photographs.